BEST OFFER ! I will add 10,000 Plays, 220 Favorites PLUS 150 Repost MixCloud from my Fans . 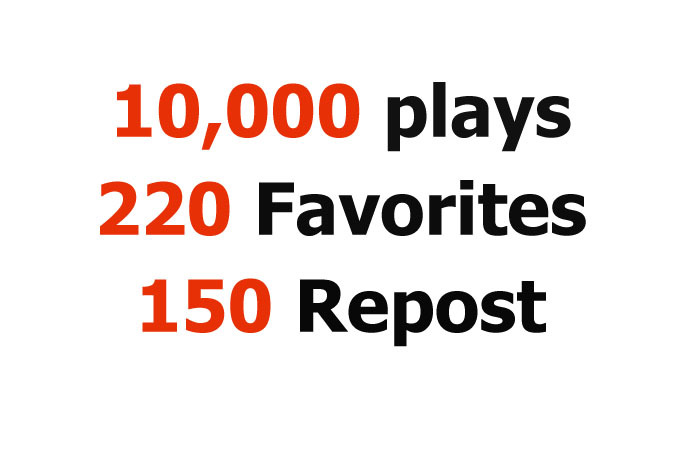 I can deliver up to 500,000 plays or 1000 Favorites/Repost on Mixcloud for each tracks. All plays are from unique IP . You can spread up to 3 tracks. We Online 12 hrs/day to Help you !!! If you want get Comments - please check the gig extras. Add 10000 Amazing Plays, 220 Favorites PLUS 150 Repost MixCloud is ranked 5 out of 5. Based on 52 user reviews.